our pond and stream area. That is absolutely gorgeous. I would love something similar in my front garden, so much so that I may steal your idea lol. Love the shape of the pond . . . beautiful design idea! Quite creative...the water feature just adds that extra punch! Very nice and natural looking Shirley. In answer to your question about a design idea for hiding a UV filter,what about building a box using wood cladding to house it and put a hinged lid on top as a seat.It depends where exactly you will put it.If at the side of the pond on say the grass, you could put a small trellis infront of it and grow some climbers up to hide it more. If on the pathway at the edge of the pond then it could still be used as a seating area to view the pond from close quarters and just be a feature as a seat.You also have to bare in mind the pipework from the pump to the filter and back to the pond and of course the electrical supply cables.They could be routed into the box through holes at low level but disguising the pipes isn't easy.Also how easy is it to get the electrical supply to the area?You will need to protect the cables. Another idea would be an Oberlisk to hide it in.In case you're not sure what that is,it is like a square or triangular framed decorative trellis that tapers towards the top.Think of the Eiffel tower on a small scale made of wood/trellis.This could sit on the lawn area not too far away from the pond and the pipes could be hidden under the lawn and brought up inside the Oberlisk,plants are then grown up it.The electrical supply could still pose a problem though. Hope this gives you some ideas on what to do. superb pond and garden. Are you a professional designer? If not you should be! barley straw into the pot. Start the water flow and you now have a wonderful biological filter that fulfills all of your ponds needs. Within the lava rocks nooks and crannies will develop a bacterial biofilm which will process toxins from fish urine and solids into non toxic substances. In turn the barley straw within a month, will clear your water of algae- no need for a UV clarifier. To clean your pump and hose all you need to do is attach a power pressure nozzle to you garden hose pull the pump tubing out of the pot (leave the pump on) hold the tube opening to the power nozzle head tightly and pull the trigger to create a backflow through the pond tubing and pump. This will blast out any obstructions from the pump intake such a vegetation and or snails without ever turning the pump off or removing it from the pond for cleaning. This method is so easy that I clean the system every other day, it takes about five minutes. Once a month take the hose out of the pot and place it into the pond. This will allow you to take the pot and remove the lava stone. Then hose out of the pot the muck filtered out by the lava layer. Place the lava rock and barley bag back into the pot.Reset the pot as before and reinsert the tubing. Never wash the lava rock with water from the garden hose, the chlorine in it will kill the beneficial biofilm. This system is really very simple and requires little effort which in turn encourages more frequent maintenance of your pond. What a beautiful & natural-looking pond & planting. I would dearly love to put one into my new garden, & when I do, I hope it turns out to look even half as great as this one. I was wondering if you know the name of the low-growing red shrub, planted next to a green shrub on the wall side towards the back? Does the stream flow or is it all at the same level as the pond? Absolutely lovely, this is my idea of a perfect garden. 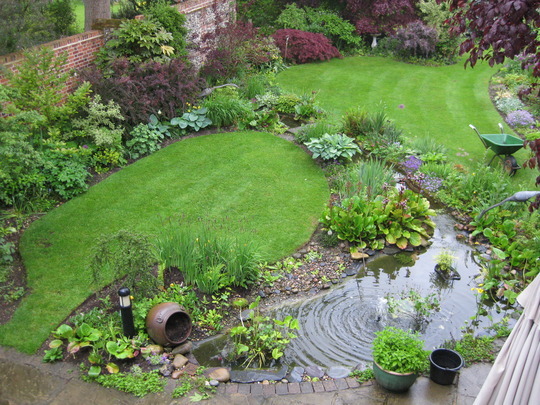 I'm planning a pond for next year so ill be looking over your picture again for some ideas. Well done. Your water feature is lovely & very natural Shirley.